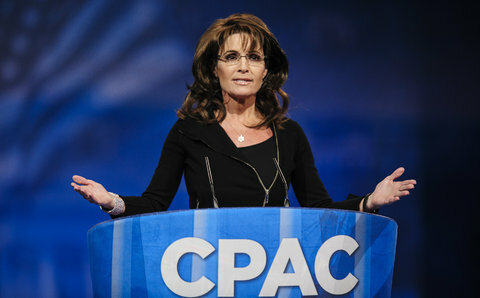 Did you see Governor Palin’s speech at CPAC? Our concern is deeper than party—our concern is for the future of our children and grandchildren. What will our legacy to future generations be? DC politicians have been getting away with business-as-usual for far too long, and the American people have had enough. We at SarahPAC are fighting back by helping to elect proven conservatives like Senator Ted Cruz of Texas and Senator Rand Paul of Kentucky. But we cannot do it alone. We need the help of hard-working Americans like you to help us stand behind these common-sense conservatives and work to send reinforcements. Together, we can encourage and elect new conservative voices who will challenge the status quo in Washington, work to restore our founding principles, and inspire generations of conservatives yet to come. Will you join Governor Palin’s efforts and help us rebuild our country with a generous donation of $25, $50, $100, $250 or more by clicking here today? Governor Palin’s exceptional speech at CPAC 2013 was well-received, with loud applause and repeated standing ovations from the audience. CSPAN has posted an archival video of her speech, and you can practically get a transcript by reading the many articles that have been written about it. Here are excerpts from a few of them. Former Alaska Gov. Sarah Palin delivered a barn-burning, hyper-folksy speech to conservative activists Saturday, bringing the entire audience to its feet multiple times. Palin’s speech at the Conservative Political Action Conference started in an unconventional way: After she was first introduced, the crowd was shocked to see Texas Sen. Ted Cruz walk out onstage. Cruz said he was there to introduce Palin himself ahead of his keynote speech later in the afternoon. When Palin herself entered, the entire crowd surged for the first of many times. Palin waved energetically as she was welcomed, then immediately thanked Cruz. Palin wasn’t close to finished. 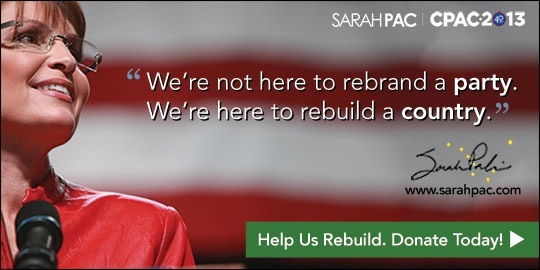 She moved on to attack the calls for “rebranding” of the Republican Party. But when Palin left the stage, for those few moments, it was all about her, leaving the audience roaring on its feet for several minutes straight. Returning to the national stage, Former AlaskaGov. Sarah Palin said Saturday that the Republican Party must broaden its message to grow. Instead of focusing on rebuilding the Republican Party, she said that party leaders should focus on rebuilding the middle class. She jabbed President Barack Obama and the Republicanprofessional class alike, urging the crowd to reject the ideas of political consultants and pollsters, taking a not-so-subtle dig at Karl Rove, a former adviser to President George W. Bush and a co-founder of outside group Crossroads USA. “The architects can head on back . . . to the great Lone Star State, and put their name on some ballot, though, for their sake, I hope they give themselves a discount on their consulting services,” she quipped. Sarah Palin called for the conservative grassroots to avoid consultants in a fiercely anti-establishment speech that received the strongest response yet from a packed auditorium at the Conservative Political Action Conference (CPAC) on Saturday. “The next election is 20 months away. Now is the time to furlough the consultants, and tune out the pollsters, send the focus groups home and toss the political scripts. Because if we truly know what we believe, we don’t need professionals to tell us,” Palin said, one of at least a dozen lines that received standing ovations and sustained cheering from the crowd. Palin pleased the crowd with a number of punchy one-liners that drew laughter and widespread applause. She criticized President Obama for claiming to want to have the most transparent administration ever, charging “Barack Obama, you lie!” a reference to a House member shouting the same thing at Obama during a 2009 joint address to Congress. And she lambasted the president for, she said, continuing to campaign instead of govern. “Now step away from the teleprompter, and do your job!” she said. In a jab at New York City Mayor Michael Bloomberg’s recently defeated plan to ban large sugary drinks, Sarah Palin brought one with her onto the stage at CPAC! In a moment that drew a huge response from the crowd during her address, the former VP candidate unexpectedly pulled out the huge beverage and took a sip. “Oh Bloomberg’s not around, our Big Gulp is safe,” she quipped. It started with a very nice introduction by a young woman from the NRA emphasizing Palin as an example to young conservatives, especially women. (I will post a transcript when I find it.) Then, just as the crowd began to roar in anticipation of Palin, out walked, instead, Ted Cruz. He delivered a short introduction reminding the audience of Palin’s importance in recent elections, including a comment that without Palin, Texas would not have Ted Cruz as a senator. Then Palin did come out, to an even greater roar than the first abbreviated one. She has become an excellent speaker. You can tell from the leftist media that the current equivalent of Journolist has sent out the talking point for the day — “she’s just an entertainer.” The line was repeated too often in the early commentary for it to be an accident. Well, she is an entertainer, just as Reagan was an actor, Franklin Roosevelt was a radio personality, and Winston Churchill was a writer. She entertains her audience with humor and wit, using them as tools to get across serious messages. Her style choices were interesting, too. She was dressed in casual but elegant black pants and shirt. Her hair was also casual, but disheveled in a way that takes considerable skill. She is tanned and looks very healthy. She is too thin, but that probably comes from the need to be in front of TV cameras, which add pounds. She spoke to the audience as friends, with lots of expression and gesture, and throughout the talk she was clearly enjoying herself, especially when she delivered the one-liners. The look was casual, but the presentation and packaging were not. I have seen some good speakers, and she is formidable, in way that meshes with her person, her history, her message, and her target audience. Governor Palin’s speech was a mixture of substance and humor, packed with many quotable quips and statements. This was definitely one of her best speeches yet. One remark that has somehow escaped notice is the one she made at the end of her remarks about Margaret Thatcher. Gov. Palin said “we could use a leader like Maggie Thatcher today!” 2016 anyone? The permanent political class is in permanent campaign mode. (Sigh.) So where do we go from here? One of my idols, Lady Margaret Thatcher – she offered this advice (applause) after her party lost to the . She told fellow conservatives not to get lost in abstract debates and green eye shade accounting. Mrs. Thatcher advised conservatives to focus their concern first and foremost on the people. She said, “Look at every problem from the grassroots – not from the top looking down.” She also cautioned conservatives not to go wobbly on their beliefs, to which I offer a hearty “Amen, sistah!” We could use a leader like Maggie Thatcher today! Emily Schultheis and James Hohmann at Politico wrote a fairly comprehensive description of Governor Palin’s speech, filled with quotes but laced with snarks and swipes. Taking the stage to Shania Twain’s “She’s Not Just A Pretty Face” and pulling out a Big Gulp mid-speech — a dig at Republican New York City Mayor Mike Bloomberg’s crackdown on oversized sugary soda — Palin served up almost 30 minutes of uninterrupted red meat and left the crowd of activists more than satisfied based on their response. In her typical boisterous and confrontational style, Palin delivered an unapologetic defense of conservative principles, asserting that the GOP doesn’t need to “rebrand” itself but instead needs to fight back against President Barack Obama and establishment Republicans. She quoted former British Prime Minister Margaret Thatcher in insisting that conservatives stand strong in their principles even in the face of defeat. Palin accused Obama of introducing a state of permanent campaigning in the country. Ultimately, she said, politicians in D.C. are “too scripted” and conservatives need to fight for new leaders. They like her, they still really like her. Sarah Palin had the CPAC crowd on its feet Saturday afternoon with a speech full of folksisms, one-liners about President Barack Obama, attacks on Karl Rove, and a couple wildly popular sips from a Big Gulp stashed in the podium before she came on stage. Former Alaska Gov. Sarah Palin lit up Conservative Political Action Conference 2013 Saturday like only she can. We know that Sarah Palin can drive people “bat crap crazy” just like Ted Cruz said, but when some Comcast customers were treated to an all-Palin channel lineup in place of their regularly scheduled programming, well, this happened. Is the culprit the Emergency Alert System? We know the country’s in trouble; is Comcast suggesting viewers stay tuned for further instructions from Sarah Palin? Time to raise a super-sized plastic cup and get your gulp on. To freedom!